A question that comes up every now and then is how to use multiple base-folders in a folder-based library. Folder-based libraries are those, that have nothing to do with iTunes, but basically contain all songs in a given base folder (more info). By default, folder-based libraries are based on a single folder and the beaTunes user interface does not let you add other folders. Despite this, beaTunes 4 is capable of basing folder-based libraries on more than one folder—but it requires a tiny bit of hacking. beaTunes stores information about music collections in a file called preferences2.xml, which is stored in the folder ~/Library/Application Support/beaTunes/ on OS X and in %LocalAppData%\tagtraum industries\beaTunes\ on Windows. Unfortunately, the folders are a little hard to find on both operating systems. On OS X, ~/Library/ is hidden—use Go -> Go to Folder... in Finder to find it. On Windows, simply copy the mentioned path and paste it into the File Explorer's path field. 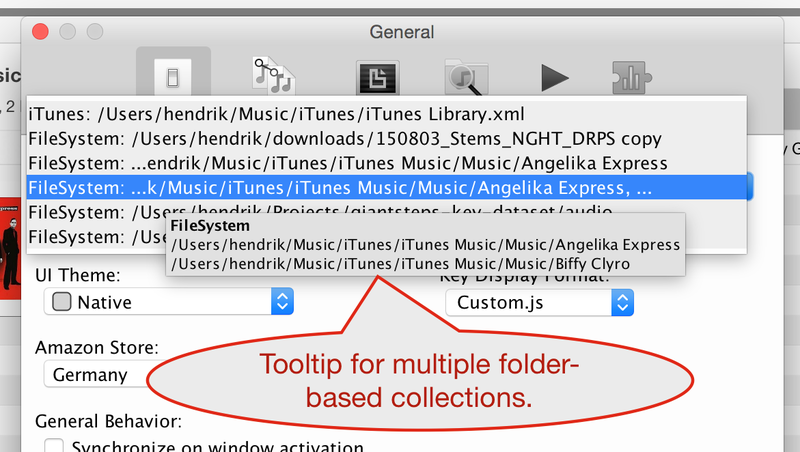 Now save the preferences2.xml file, start beaTunes and select the library we just modified. To identify which one it is, open the beaTunes general preferences and open the combo box that lists the existing libraries. When hovering over the items with the mouse, beaTunes will show all root-folders for each library in the tooltip (screenshot). Once the right library is selected, you may need to synchronize via the File menu, if beaTunes isn't doing it automatically. The example above assumes that you already have multiple folder-based libraries and shows you how to merge them into one. However, multiple libraries are not strictly necessary to add another base-folder to a library. In fact, you can simply add a new <root>-element to an existing <file-collection>, save the file and then start beaTunes (again: don't edit the file while beaTunes is running!). The two things you have to pay attention to though, are overlaps and loops. You should never add a folder to the file collection that is in some form a sub-folder of an already existing <root>-element. Also, you should never create loops in your directory structure, e.g. via symbolic links. I hope this helps some folks with sprawling libraries. If you have any questions, please don't hesitate to ask.